← The 2015 Multistrada will be revealed at EICMA: What we already know about it. There you go my friends, time to end one set of rumors… and start another. 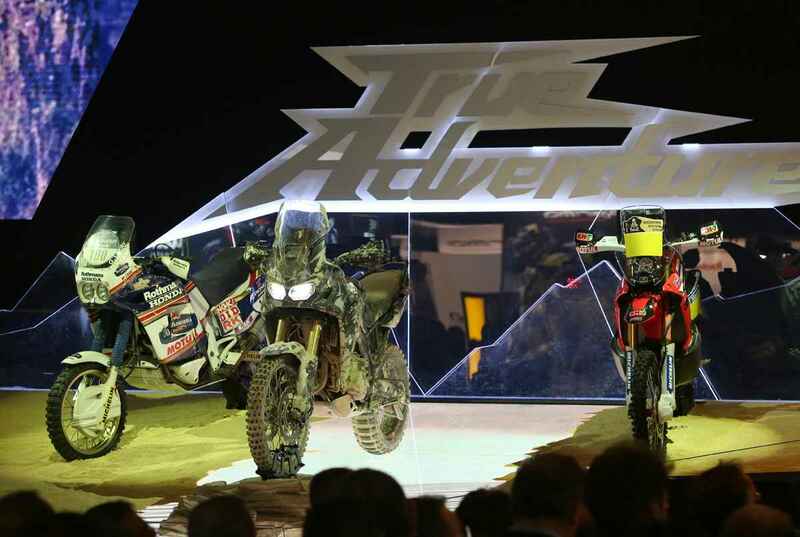 Under the title “True Adventure” Honda showed three bikes at the EICMA 2014 event in Milan this week. 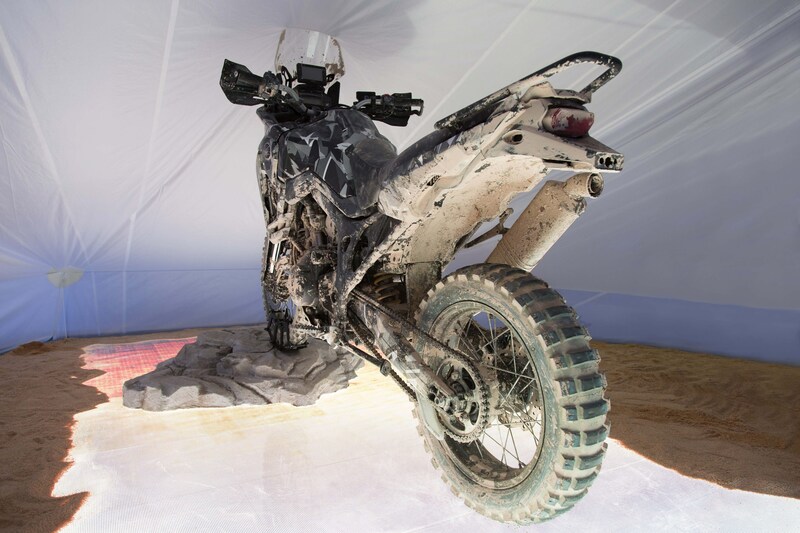 On one side a 1980’s Honda Twin Dakar racer – the one that eventually became the iconic Africa Twin, on another side Honda’s current Dakar race bike (450 cc single), and on center stage, covered in mud, a prototype of a bike that seems to include elements of the other two. True Adventure: Original Honda twin from the late 80’s Dakar races on the left, the new Africa Twin on the center, and on the right the current Honda 450cc Dakar bike. 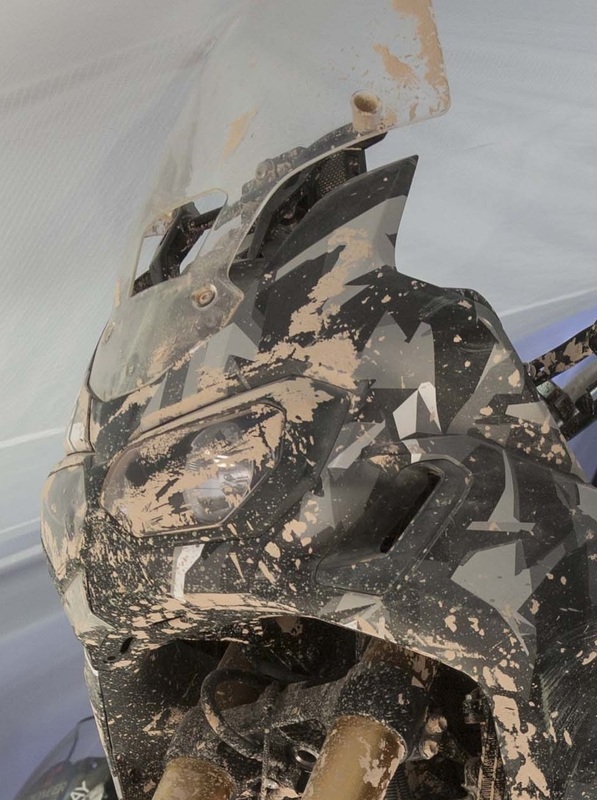 We can’t go wrong by saying this prototype, or something very close to it, will be Honda’s new Africa Twin – which is now rumored to be out by the fall of 2015. We are one step closer to the final product! And from what we can see from these official images, and in our opinion, Honda nailed it! 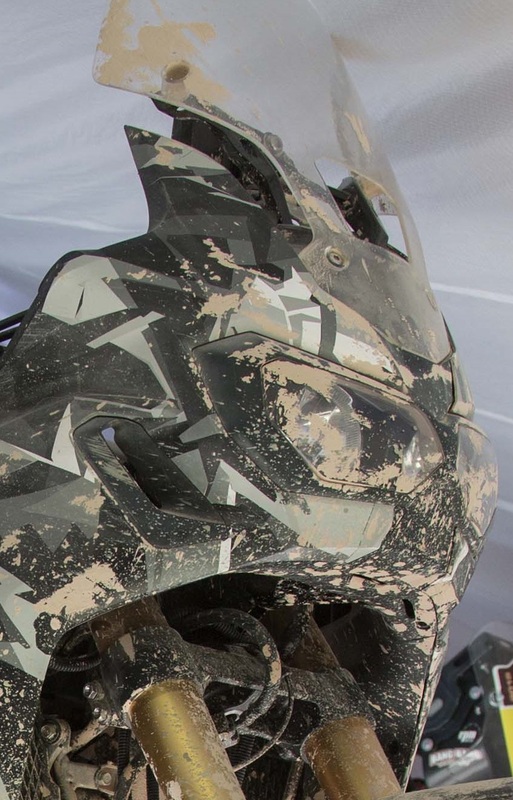 We are making some assumptions here, of course, when we imagine this will be a true enduro machine. But everything seems to point to it. 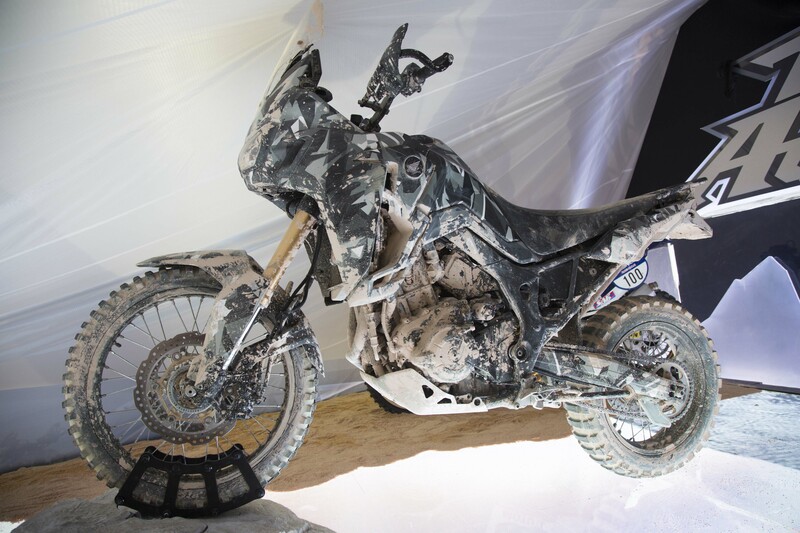 Other than this stage set up with the two Dakar bikes and the official Honda promo photos of this bike we are sharing here, nothing else has been said about this bike so far and as far as we know. 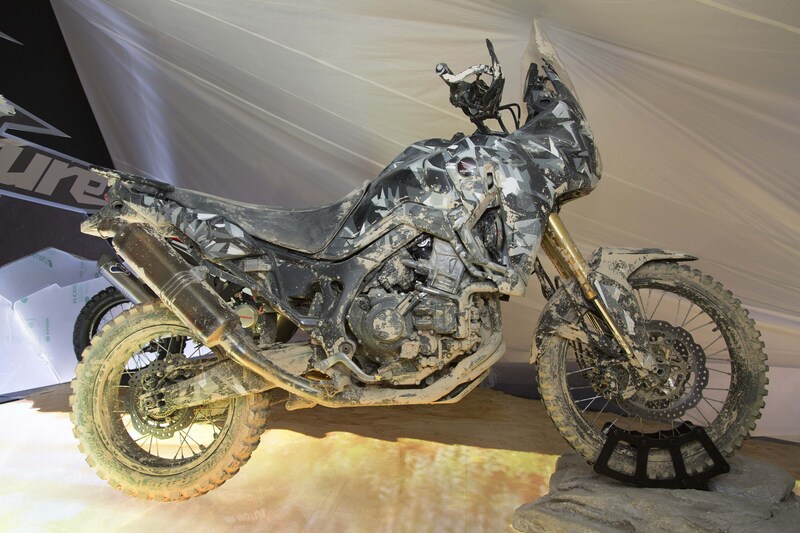 That is, this bike under a camouflage paint scheme and dried up mud is all we have so far. 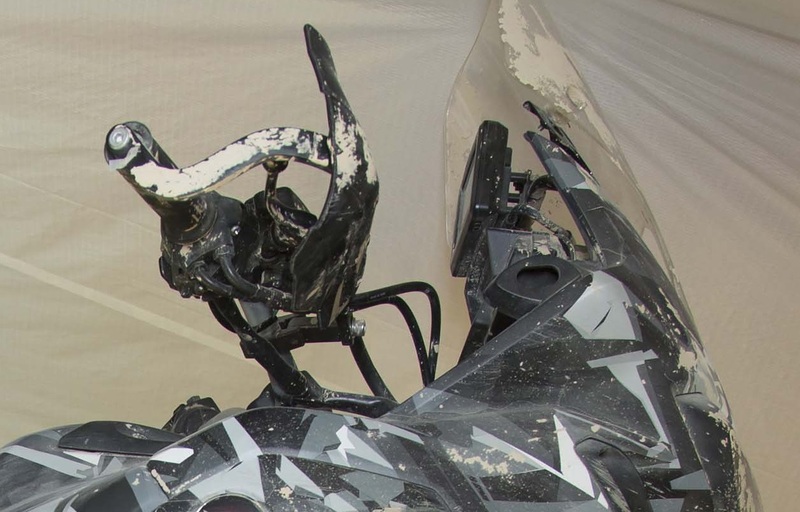 So we are back to rumors, but now we have rumors fed by images coming from Honda itself. 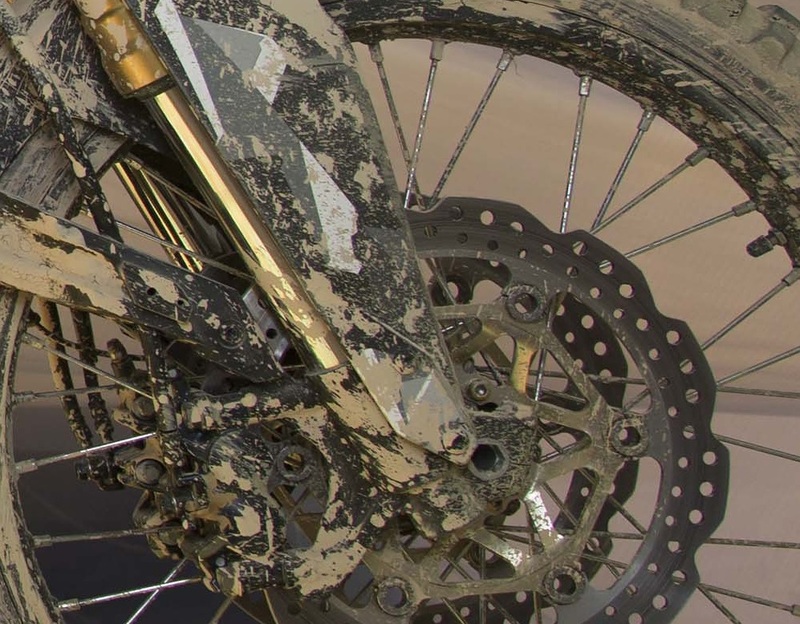 So let’s use these images provided by Honda to pick this bike apart and make some sense out of it. 1. Two airboxes? 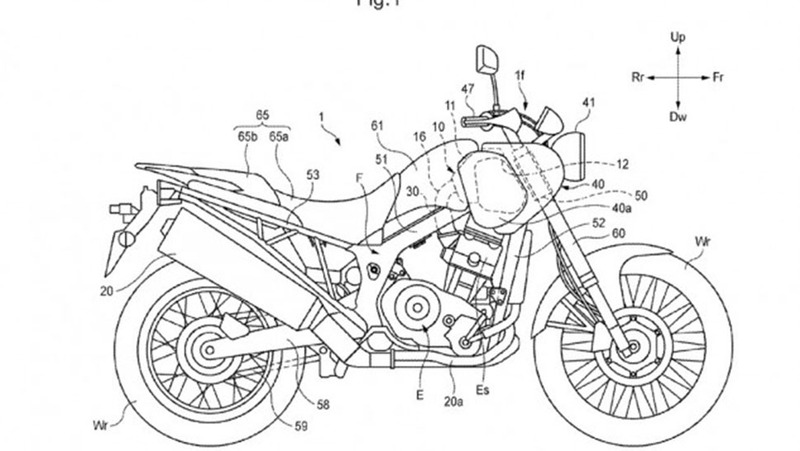 The bike has two air scoops high up on each side of the front fairings and flanking the tank sides. This goes well with the rumors we discussed here on previous posts about this bike, where we presented Honda’s patent on a two-part airbox system, to be mounted on either side of the tank and replacing the traditional location of an airbox, which in general occupies a large portion of space in the middle of the bike, below the fuel tank and seat, and on top of the engine. There is hope for something especial on this department, with fuel more in the center of the bike and lower perhaps even under the seat. At the same time, it makes it easier to maintain the air cleaner, or cleaners, we should say. This is something important and practical for a bike that will be ridden often on the dirt. 2. Two radiators and an oil cooler. It has also been mentioned here before that this bike would have two radiators, mounted on either side of the fairings. That has been confirmed as well. And an oil cooler is added to the equation (peg side of the bike). 3. Frame and sub-frame in one piece. 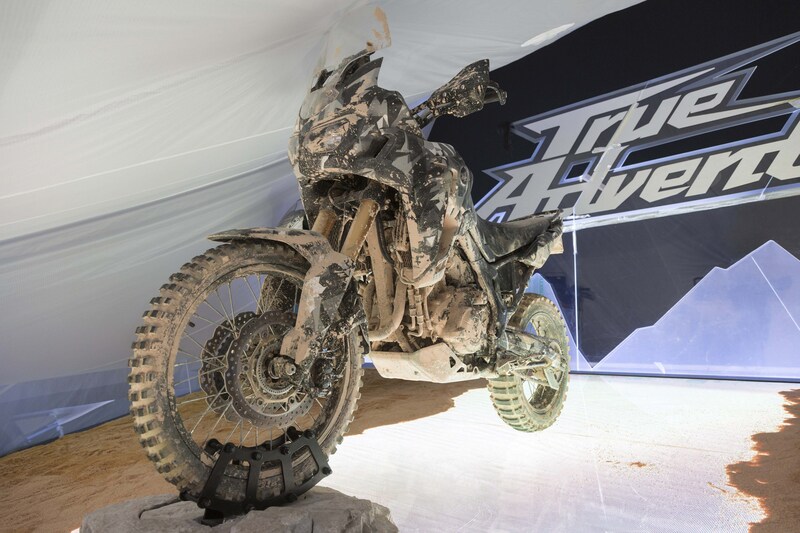 This is somewhat of a controversial idea, when considering there is “adventure” on the title of this bike’s presentation. But I consider it good because we shouldn’t use rigid bags on real adventure bikes. And a one-piece frame certainly works well for a rally/enduro machine. Frame & subframe in one piece. Aluminum? Seems like boot marks on the frame, good sign if it means it is a running prototype! Looking at other mid-range bikes, the worst bike on this frame scenario is the Tiger 800XC, which has a single frame, but it has passenger pegs welded to it. Why is it an issue? When the pegs hit the ground, and this is something that happens since bikes hit the ground, and with pegs protruding quite a lot they become a leverage point, and it has been cases when they bend the frame, and then the bike has become a total loss (in the United States that is the case). 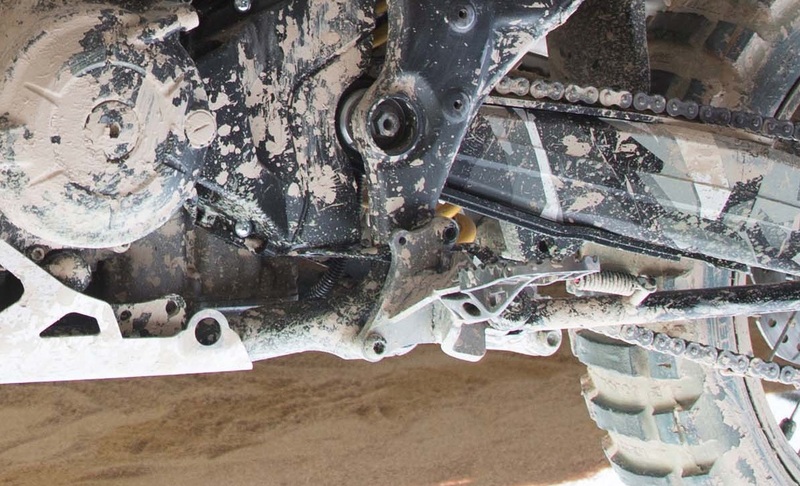 BMW F800GS has a bolted subframe to the bike, and that is the case for most adventure bikes. You bend it, you change the subframe. Done! But on this Honda prototype, despite the single frame, the passenger pegs are a bolt-on affair (they are not included on this prototype – but you can see the holes). An advantage? Yes, several: lighter frame, a more rigid frame, and you don’t ever need to worry about subframe bolts coming lose. And lose they come and what a mess it is when they do in the field and you rode for miles with the lose bolt eating threads. Two recommendations: remove the passenger pegs and use soft bags for true adventure rides on this bike and the frame will likely never bother you. That is the typical use for aggressive or real off road riding, anyway. Someone from the press has mentioned this is an aluminum frame. Good, it helps keep the weight of this bike low. And adds even more rigidity to it. Good again. 4. Parallel Twin Motor. None of the photos give a good idea about the cylinders’ portion of the motor. But from the account of people who saw it life, it is likely a parallel twin motor. The size? From what we can see on the images, the cylinders seem smaller than what you would expect if they are side by side and each one of them displaces 500cc. But then, it can be a long stroke motor, which would go well with the idea of a lower rev torquey motor. If that is the case, it seems close to the rumored 1,000cc, perhaps slightly less. Or, on a more far fetched speculation, but based on rumors on the internet (and we know internet information counts, right? we are all in it after all) it could be that this is the smaller version of the bike, the 500cc Elsinore version of the new “True Adventure” Honda line. 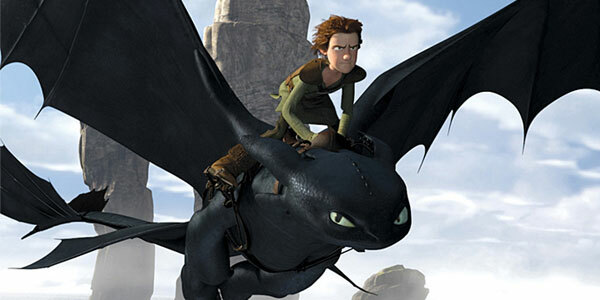 And it could even be a single cylinder motor, if you want to go to the extreme of what is possible based on the photos. We know the photos clearly show two headers, but there are plenty of single cylinder motors with two exhaust headers. And if we go by what the older rumors indicated, this should be a 1000cc motor and would have a 270 degree crankshaft angle, making things more interesting for a parallel twin. Eventually we will know more about this very important part of the motorcycle. 5. Dual-clutch automatic transmission – DCT. Right, you and I may be the only two who do not quite appreciate this. But I bet Honda will provide a manual transmission version. Well, they should! Nothing wrong with DCT, just that one of our true moments of joy when riding a motorcycle is the actual shifting job, clutch in, clutch out in the blink of an eye. We understand DCT may be more efficient and does a better job than humans can in terms of gear changes. 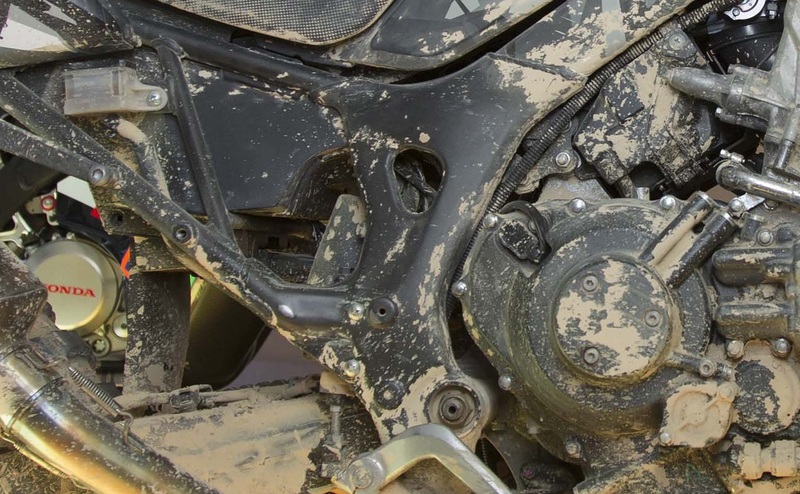 But shifting is not a safety issue like ABS or Traction Control are, and which are items we appreciate on a motorcycle. Shifting is simply fun and it is a great part of the riding experience in our opinion. Where’s the shifter? DCT on board. 6. Wheels 21 front, 18 rear. This bike has the wheel sizes for a true enduro machine. We hope those wheels remain on this size on the final product. Lots of aggressive dirt tire options for this wheel combo. 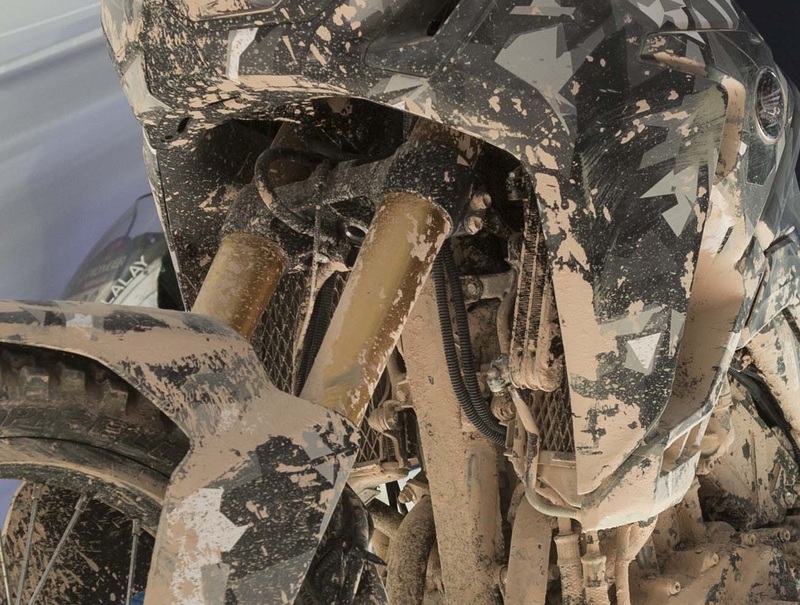 This could be another indicative of the seriousness of this bike for dirt applications, a true rally/adventure machine. 7. Suspension Travel. Difficult to elaborate on it. Front forks, about 7 inches of travel. The radius of a 21 inch wheel is 10.5 inches and is measured from the center of the axle to the inside of the rim. With that perspective in mind, the visible area of the fork, as seen on the above photo, should measure some 7-8 inches, add unladen sag, maybe it has about 9 inches of travel. 8. Round headlights, like the original. That’s what it appears to be. Under the larger glass area that has some geometric shape to it with somewhat straight lines, we can see round headlights. That is a nice touch! Lots of enduro-styled design elements: nice wide pegs, seat looks good as a one piece in a single swoop, tall handle bars, nice tall perch for a GPS. Also it has a tall rally/dakar styled screen which seems to be adjustable on height and angle. 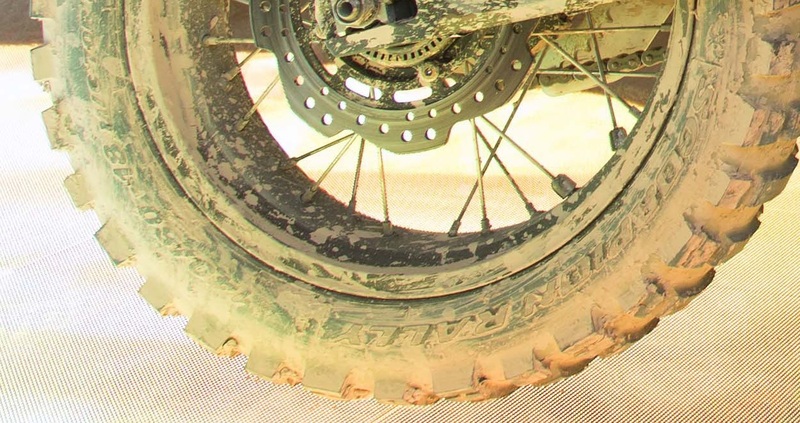 The rear wheel sensor ring indicates ABS will be available, as we would expect. Nothing has been mentioned abut tank size and nothing can really be judged about its size considering the speculation about the air cleaners being up high on the bike on the sides of the tank. Except we can say it is not a large, bulky tank, which is a good thing (if it takes 5 gallons of gasoline for a 200 miles of range, that is). What can we say? Overall it seems the photos give an impression of this being a serious off-road machine. 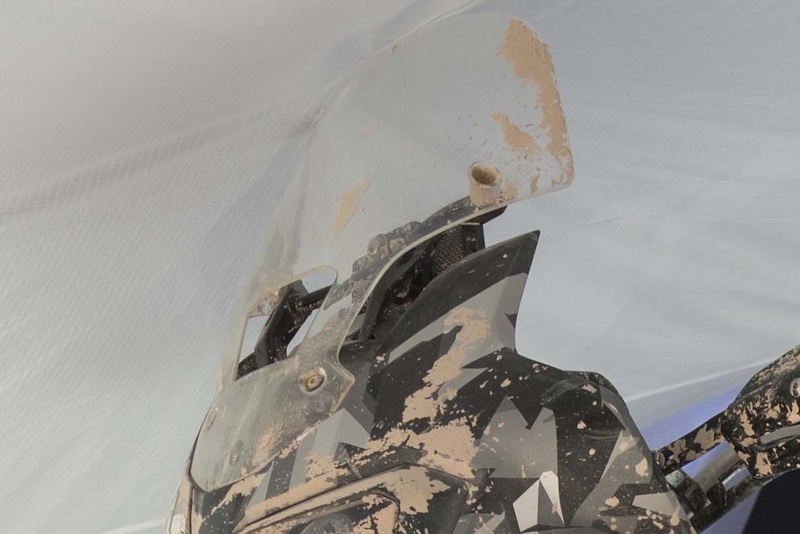 Wheel sizes, the frame, the dimensions and ergos, the style, from what we can see, it all points out to a machine that would look comfortable at speed on the desert. The exhaust on the prototype seems a bit on the “race” side of the equation. So one can imagine this will be modified somewhat, and it should have a cat converter at some point, if it is not on the muffler itself. The real deal! Will it really be made? We know a final product will be different than what we see in these pictures, the older speculations seem to have proven to not be fully correct, as one could expect, so here we are, like many of you across the world, waiting for more information from Honda about this bike, their plans, when they will be available and all that fun stuff. Overall the general theme offered by this bike is a great one and we hope Honda sticks to it! We should say Honda is finally showing it has the courage to build something that will not only look good in front of a Starbucks, but which is fit for the desert like no other bike since the KTM 990 Adventure and SE stopped being made – and it seems, and we hope it should actually be better than the KTM. It seems like a real enduro/rally machine for the serious hobbyist that will hangout with this bike in a tent in the middle of nowhere. True adventure, right Honda? By the way, this bike puts the X line in its proper place: adventure-styled touring machines designed for tarmac roads and good gravel roads. If Honda will really build this bike, if it will have this general shape, and the dimensions will be close to the previously rumored specifications, it will have a regular 6-speed manual gear box as an option, this bike is likely going to sell well on our corner of the world when (and if) it becomes available in the United States. Updates will be posted on this site as they become available. 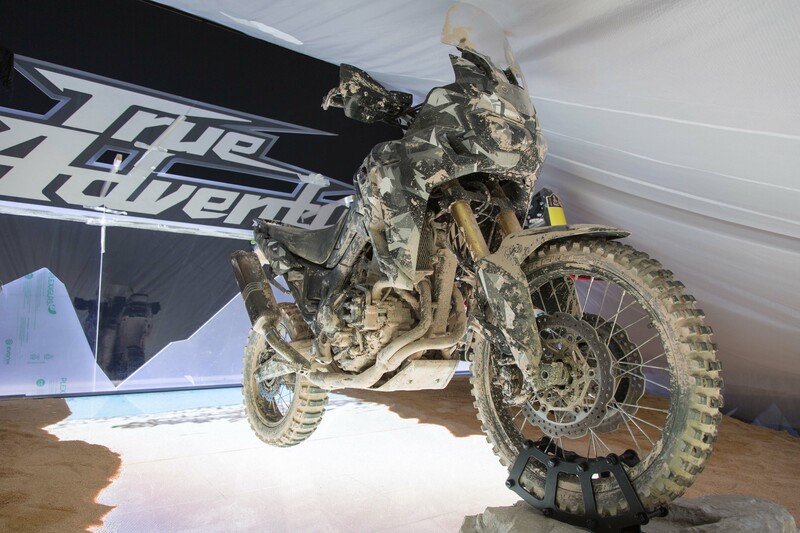 This entry was posted in Bike Reviews and tagged Africa Twin Prototype, EICMA 2014, Honda Africa Twin, New Africa Twin, True Adventure. Bookmark the permalink. If it all goes as it might, congratulations to Honda for nailing it. Here’s hoping. Thank you for an excellent article and great observations. Looks like a TKC 80 up front, Midas E09 at the back. Exactly right. Honda this is it! Looking forward, we waited all the time, we wish to wait no more, awesome break down!